We are often told that our toys are good looking enough to be displayed as decorations, and we also make high quality storage solutions like a rolling toy box, toy storage shelf, and dressing bench to help keep toys organized and up off the floor. But what we think you might be looking for is more along the lines of our Personalized Clothing Rack. Personalized items are an extremely hot item for home decor and personal toys are always popular as holiday gifts. 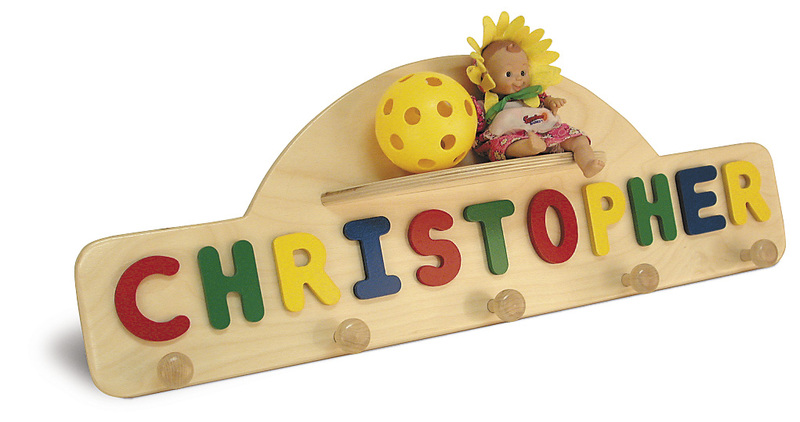 In addition to the clothes rack, we have other personalized furnishings like the Toddler Step Stool, and personalized toys like the Make Your Own Name Puzzle, and the Name Train. Personalized items make great holiday gifts because they help teach youngsters how to read and spell their own name, and they become important childhood artifacts that increase in sentimental value as children grow older. This entry was posted in Babies, Childhood, Childhood Development, Children, Education, Infants, Kids, Pre School Kids, Toddlers, Toys, Uncategorized and tagged christmas, family, furnishings, furniture, personal gifts.